Alice Smith Elementary is a neighborhood school that enjoys a richly diverse student population. Each year the community comes together for an evening of celebration and fellowship to recognize the various cultural backgrounds of the students and staff. The school hosted the 13th-annual Heritage Festival on Thursday, March 15, where event-goers feasted on a global potluck and took in several performances. 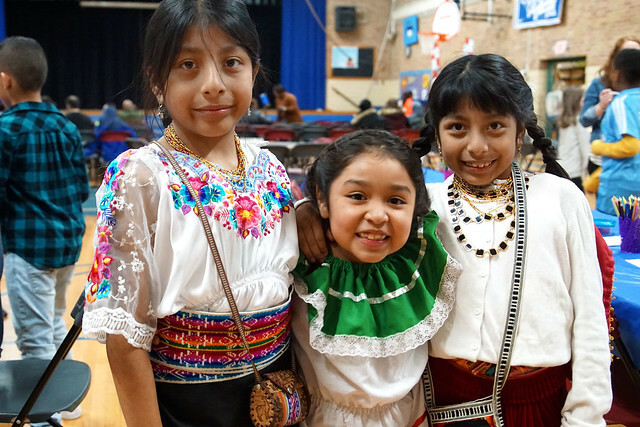 Dancers from the Art of Dance Studio in Minneapolis performed, and students and members of the school community showed off their traditional dress wear with a fashion show. Also, fourth-grade students warmed up their vocals during a nine-song concert that included “The Star-Spangled Banner,” “Celebration” by Kool and the Gang, and “Sarasponda,” the Dutch spinning song. Several activity stations also provided learning opportunities for participants. There were booths about traditional Mexican masks and Indian historical artifacts. Students also tried their hand at weaving a traditional Guatemalan rug. There was even a station dedicated to the ancestors of students. Heritage Festival took a page from the WE Movement, which celebrates the global communities within schools. Using a WE postcard, students wrote letters of support to members of the military and to new immigrants and refugees. At Alice Smith, there are over 20 countries represented within the students. And this festival is a chance for students to learn more about other cultures, especially their own.